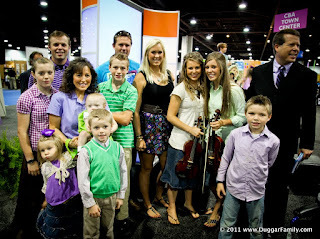 Duggar Family Blog: Duggar Updates | Duggar Pictures | Jim Bob and Michelle | Counting On | 19 Kids: Two New Episodes Tonight! If you live in the US or Canada, tune in to TLC tonight for TWO brand-new episodes of "19 Kids and Counting!" After fulfilling an Atlanta speaking engagement, the Duggars gear up for jet skiing, tubing, and wakeboarding. But the fun is interrupted when Jason falls 12 feet into an orchestra pit and is whisked off by an ambulance. The Duggars have the privilege of meeting Bethany Hamilton, the Hawaiian pro surfer who lost her arm to a shark at age thirteen. They also have a blast at a local aquarium. And as always, make sure to return to the blog later this evening for our famous recap! The episodes can also be purchased on iTunes and Amazon 1-2 days after they air for $1.99-$2.99 each. Yes I have been there but I was only in the airport. Haha! Maybe one day I can actually step out of the airport and go see the sites! I went to Atlanta for the 2011 ICRS, but I went day after the Duggars were there, so i missed seeing you all! :( I also went to the Georgia Aquarium day after ICRS. It's a great aquarium!! Yes, My cousins live outside of Alanta and met the Duggars!Actully,my 16 year old cousin and her friends did.The aquarium is amazing.